October is here and the weather is boasting it’s beauty! The leaves are shedding their green hues for a richer color palette of yellows, oranges, and reds making for a picture perfect view. This year the leaves are still in the process of changing at different altitudes. If you would like to see the current view, you can head over to the Webcams on the Smoky Mountain National Park site. Almost Heaven – This 2 bedroom, 2 bath cabin is located minutes from the National Park. Spacious log cabin with all of the amenities. You can enjoy the fall color from your hot tub or porch –no hiking necessary! spectacular winter mountain views, will sleep up to 6 people and offers recreation for the whole family including a fully equipped gameroom, Jacuzzi, hot tub and picnic tables…located just minutes from the Smoky Mountain Arts & Crafts District. Chipmunk Haven – This is a cute, private log cabin with a view, a rare find! Chipmunk Haven has 2 bedrooms and 2 baths, an outdoor hot tub, an indoor whirlpool tub, and is located just 3 miles from the downtown Parkway in Gatlinburg. On The Rocks– This adorable two level log cabin is equipped with a wood-burning fireplace, an outdoor hot tub and has a mountain views! With a two bedrooms and 1 1/2 bathrooms, there is no better place to spend your vacation or family weekend getaway! Conveniently located close to Downtown Gatlinburg, Pigeon Forge, and the Great Smoky Mountains National Park. Winfield Heights – From a spa-like couples getaway to a family-fun vacation, the cabins of Winfield Heights offer you and yours deluxe accommodations and amenities–in-room whirlpools, outdoor hot tubs, pool tables & fireplaces. Enjoy both a mountain view AND a downtown city view! This blog is sponsored by ERA In The Smokies Realty and Rentals located at 207 Parkway in Gatlinburg. For more information on a Gatlinburg Cabin for your Smoky Mountain Vacation or all the reasons to move to the Smokies, call 865-430-3366. ERA In The Smokies is a leader in chalet and Log Cabin Rentals and Real Estate Sales in the Gatlinburg area. At the Top & Above the Rest, at Winfield Heights! Coming to Gatlinburg for some holiday shopping and don’t want to be to far from the strip? Winfield Heights is a unique destination spot, which is located less than a mile from Parkway. These three duplex cabins offer a convenient location with accommodations and amenities in mind! Their distinct setting, graciously gives the guest a marvelous view of the lively Gatlinburg area and its surrounding mountains. For that reason, they are continually admired from those who have ridden the Ober tram. While staying in this comfortable setting, one can fulfill their holiday shopping, as they check out all the unique places there are here. The Village is a quaint little plaza with an old world setting. It has a unique collection of boutiques, eateries and galleries. Arrowcraft, is one of the Southern Highland Craft Guild Shops and is the oldest gift shop in Gatlinburg. This historic shop sells the best crafts from a nine-state region – weaving, basketry, pottery, woodcarving, glass, and toys – ensuring that these skills passed from hand to hand for generations will be preserved for the future. The Marketplace is a cute little place, with shops that provide an eclectic mix of brand name, specialty and artisan stores. Experience fine architecture, authentic gas lit walkways and mingle in the local culture. Baskins Square Mall has the Mountain Woodcarvers Shop, the Little Sparrow Gallery, the Scents of Gatlinburg, The Lollipop Guild, God’s World, and Doc’s Magic Shop. One can always take the trolley and set out for The Arts & Crafts Community. The 8 Mile historical loop is a place to find; gorgeous quilts, old-fashioned straw brooms, exquisitely woven baskets, hand-dipped scented candles, ceramic pitchers, pottery, dulcimers, stuffed bears and leather vests. The handmade jewelry is unlike anything you’ll find in a mall back home. If there is something quite particular that you need click here downloadable PDF for an extended listing of the retail locations off the Parkway. Check In While You Check In! Get entered in a drawing for a FREE 2 night stay! take advantage of several benefits designed just for you! Subject to restrictions and availability. Cannot be combined with other offers. Excludes Peak Season and Holidays. Applies only to NEW reservations. Gatlinburg Photo Contest – WINNER! After receiving hundreds of very nice event photos, we managed to select a few of the best ones as finalists. You can view all of these beautiful photos in our Facebook album (www.facebook.com/ERAInTheSmokies)! Thank You all for participating in this contest, we will have another one soon, theme is a surprise, but go ahead and get your smoky mountains pictures ready! You could be the next lucky winner! Don’t miss the Civil War Reenactment in Pigeon Forge! The hills surrounding Pigeon Forge will rumble with the concussion of artillery fire Saturday, August, 25 and Sunday, August, 26 when Civil War re-enactors will fire a canon from the era for “Thunder in the Forge” at the Smoky Mountain Convention Center located at 4010 Parkway in Pigeon Forge. America’s most famous Confederate, H.K. 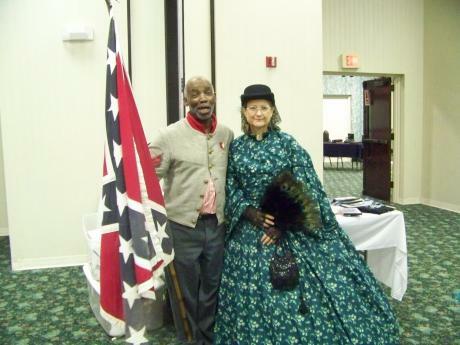 Edgarton, poses with Mary Todd Lincoln at the 2011 Relics Show. The two-day event is an opportunity for Civil War enthusiasts to meet re-enactors, visit a Civil war camp site and experience living history at an encampment. Visitors can meet members of Our Reflections of Yesterday who will portray persona from the era including Confederate General Robert E. Lee, Abraham Lincoln, General Stonewall Jackson and many others. Thousands of relics from theCivil War era will be on display for purchase including guns, knives, bullets, and other artifacts. Collectors are encouraged to bring any historical artifacts they may have to sell or trade. Noted author Col. Tom McKenny, author of “Jack Hinson: One Man War, Civil War Sniper” will be on hand to sell and sign copies of his book. McKenny’s book is the true account of a Knoxville famer whose sons were murdered by invading Union soldiers despite the fact the two young men were civilians and not involved in the conflict. Hinson sought retribution with a one man campaign to exact revenge on the men who killed his sons. He began a series of well executed and expertly coordinated sniper attacks on the Union forces killing several. McKenny will tell the story. Hinson’s guns, which are the property of Judge Ben McFarlin, will be on display. 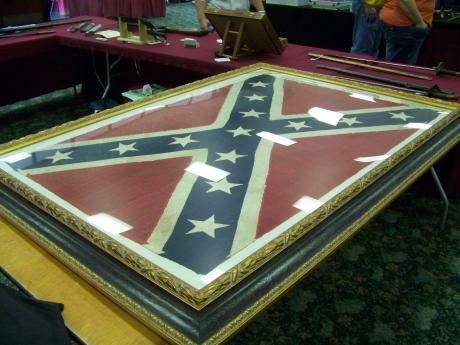 This Confederate battle flag was on display at the 2011 Relics show and valued at $300,000. The artillery exhibition will be presented by the 63rd Tennessee Infantry. The event begins Saturday morning at 9 a.m. and continues until 5 p.m. Doors will reopen at 9 a.m. Sunday morning and the show ends at 3 p.m. Admission is $8 for adults and $4 for children 12 and under who are accompanied by an adult. For further information contact Lynn Hammond at southerncross1861 @gmail.com. Tennessee Tax Free Weekend 2012 – Shop & Stay in the Smokies! At first glance “sales tax holiday” doesn’t sound very exciting. After all, when are taxes EVER exciting? But if you look closer, you’ll realize that this is a holiday FROM sales tax!! The Smokies offer tons of shopping anyway, for those shop-a-holics out there… and on tax-free weekend every year, shop-a-holics come from far and wide to enjoy that statewide discount here in the Smokies! This year, tax-free weekend is August 3-5, 2012. There are more places to shop here than I could possibly put on one blog, but here are a few of our favorites! Baskins Square Mall Gatlinburg– Baskins Square Mall is located conveniently between traffic lights #6 and #7 in downtown Gatlinburg! This mall includes about 14 shops from Claires, to Mountain Woodcarvers, to the Mountain Edge Grill! Come on down! Reagan Terrace Mall– Reagan Terrace Mall is located conveniently between traffic lights #6 and #7 in downtown Gatlinburg! This mall includes about 13 shops from Midieval Blades, to Old Timey Photos, to Fudge Shoppe of the Smokies! Don’t miss out! Tanger Outlet– The Tanger Outlet offers over 100 band name stores just off 441! Tanger is probably the favorite shopping destination in the Smokies of most of the people I talk to! It includes every type of store you can imagine, as well as a few delicious places to eat, and right next door is the Ripley’s Old MacDonald’s Farm Mini-Golf, where you can drop off the members of your family who don’t enjoy shopping while you hit the stores! Gatlinburg Adventures Zip, Zorb & More! Summer is a great time to enjoy all the adventure the Smokies has to offer! Just imagine… gliding through the shady emerald tree tops, the cool wind brushing across your face, and of course, luscious, verdant views all around! Ziplining has become quite a big deal around here. There are places, right off the main Parkway, where you can enjoy easy access, and still experience the thrill off the wind whipping across your face. If you want to enjoy ziplining in the lush green forest canopy, there are places that offer this as well! Check out our related post Zipline Fever. As an East Tennessee kid, rafting and tubing were an integral part of my childhood! A week of summer camp wasn’t complete without at least one or the other, if not both! If you love thrill and adventure, look no further than a day of white water rafting! You will be an irreplaceable member of your rafting team, as you learn to paddle together according to your guide’s instructions! Experience the thrill of making it through those roaring rapids, and in the intensity, don’t forget to look at the gorgeous creation around you! If you are more interested in viewing the creation and less interested in thrill and adventure, perhaps tubing is for you! Enjoy a lovely afternoon floating down a calmer section of a creek or small river as you gaze at the beautiful surroundings! Either way, don’t forget the sunscreen! There are tons of places around here that can provide these aquatic adventures for you! See our related posts for more info Let’s Get Wet. This vertical wind tunnel that allows you to experience the freedom of human flight and is located at traffic light #5 in Pigeon Forge. As a flyer, participants attend a 20-minute training class, receive a suit, helmet & other safety equipment. Following a short review of the basics, a group of 5 flyers enters the wind tunnel with their instructor. Almost anyone can fly as long as you weigh at least 40 lbs. Watch this video for a preview of kids in flight. Link to pricing & coupons. I remember when I was on vacation with my family in Pigeon Forge as a kid, sitting at an ice cream shop, eating our ice cream, and watching people bungee jumping down the road. It certainly is a thrill! And it’s an institution of Pigeon Forge. You can enjoy both bungee jumping and the SkyFlyer, meant to give the sensation of sky diving, at The Track. While you’re there, the slightly less adventurous members of your group can enjoy mini golf, bumper boats, and of course, the Wild Woody Go Kart Track, as well as a few others! If you are looking for challenging, professional level rock climbing, especially on real rocks, we may have to plan a day trip. But if you are fairly new to climbing, or perhaps would enjoy an easy day, just for the fun of it, we have several options to choose from! The closest place to climb some real rocks is near Townsend, a place called Look Rock. It is said to provide some great views from an observation tower that is also there. There are two rock walls that I’ve heard about. WonderWorks in Pigeon Forge has one that’s fun for adults and children alike, not too difficult. The Nantahala Outdoor Center in Gatlinburg also has one that boasts different routes for all ages and skill levels! WonderWorks also has an indoor ropes course, and Dollywood has an outdoor one. The elements in each are fairly similar to each other, but I would say Dollywood’s course has a little more variety. Also, Dollywood’s course, Adventure Mountain, has 3 distinct “trails” (and a 4th trail for the little bitties!) which you go through, and each “trail” has 3 different tracks you can choose from and switch between at each element. The WonderWorks course is a web of varying elements which you travel through in any order you choose. Both are quite enjoyable and come with general admission to the larger attraction they are in- great deal! YES, that’s a person in the middle of this big ZORB™ ball! The ZORB™ ride is just a totally bizarre and fun adventure experience where you’d be protected by a massive cushion of air whilst sphering down a hill. Throw in a bucket of water, hop inside the inflated ZORB™ ball, run, tumble, flip or slide inside it, doesn’t sound fun enough yet? Take up to 2 of your mates with you inside the ZORB™! There are a few haunted houses in Gatlinburg. “Ripley’s Haunted Adventure is a multi-million dollar haunted house featuring live actors, animatronics and bone chilling special effects.” “Experience the terror and horror of a classic, turn of the century, truly haunted house at Mysterious Mansion. Walk into a chilling haunted house with secret passageways, a damp, dark dungeon, spooks, creaks, creeps and plenty of things that go bump in the night. There’s an army of ghosts, and grisly creatures awaiting your arrival, all designed with fright in mind. Ghastly. Grisly. Grim. They can not describe the horror that awaits you at the ultimate scare in town – Mysterious Mansion. Don’t dare miss it! And, what ever you do, don’t go there alone!” For something a little more serious try the Haunted Ghost Tour of Gatlinburg. While haunted houses may be frightful, the ghost stories you’ll hear on this tour have a much larger measure of truth in them. Hear the actual ghost stories of the Smokies as you walk around town and view the places where the stories are said to have taken place. Learn a little about the history of Gatlinburg as well. And take your camera! Your guide will instruct you to take pictures at certain key locations, and you may be surprised by what you find when you look back at your pictures afterward! After an exhausting day of grand adventures snuggle down in your own cabin to rest up for another exciting day in the Smokies!